Piccadilly Circus. The name Piccadilly is probably derived from Pickadilly Hall, the popular name of a house built in c. 1611 near Windmill Street by a retired tailor. Robert Baker, who made much of his fortune by the sale of 'pickadillies', a form of collar or ruff. The street was known as Portugal Street in 1692 in honour of Catharine of Braganza, the Queen of Charles II, but changed to Pickadilly Street by 1763. The Circus, built during the 19th century, covers the site of a house and garden belonging to a Lady Hutton; the garden was near a field known as the Round Ringill. 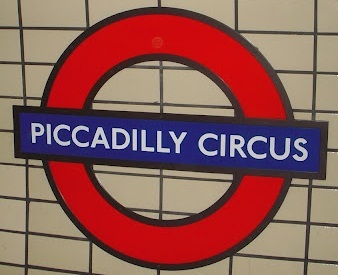 The station was opened as PICCADILLY CIRCUS on 10 March 1906. An extensively reconstructed station was opened on 10 December 1928.